We get a better picture of what our ancestors were like if we can place them in the context of their times. 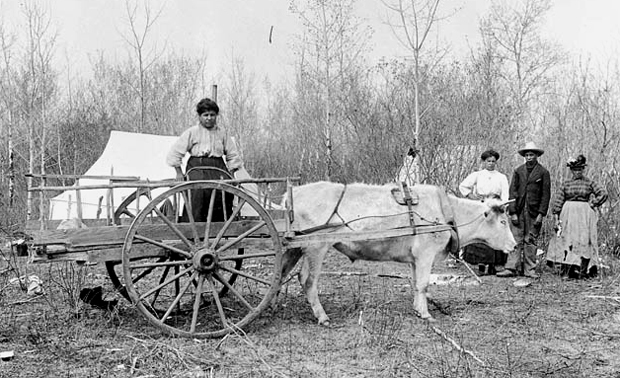 The Metis people were primarily descendants of the French fur traders. The French fur traders were from Quebec, often listed as “Canada” but their families may have been there for only a few hundred years if that. The Quebecois were primarily of Norman origin and are famous for retaining the culture of their ancestors. That became a little harder to do when you came west. The country was a creation of vastness, sweeps of prairie grass as far as the eye could see, raging rivers roaring out of the mountains only to trickle down to a creek, crippling cold…. There were people who could not deal with the isolation and hardship. Few could make the return trip home. Many came to escape oppression or poverty and many died in the attempt, especially women and children, for the promise of freedom. You may have grown up with immigrant grandparents who retained a heavy British accent which left you with a “twang” often mistaken for a Texas accent. That is a problem I had into my 30’s. You may have strange and wonderful memories of relatives you never did get to know, like the man with black braids and buckskin I saw mending the roof of my Metis grandmother’s house. During the times of the fur trade wars and Metis rebellions, members of my family were present in Selkirk and St. Boniface, Manitoba. Again, the Marie Anne Lagimonier above was Louis Riel Jr’s cousin as his mother was Julie Lagimoniere. I think it is important to note that the Metis people were a distinct society, separate from the French and First Nations. Many people ask about the native people in your family but that track could have been very long ago at the start of the fur trade. Only a few generations passed before mixed blood began to dominate and the fur traders actually married Metis women. The marriages began to be between Metis people themselves, although culturally, the buffalo hunt kept native tradition alive. Also, you may have been from a line where the father was a Scot and generally would have been termed a half-breed. What were some of the cultural symbols of Metis society? 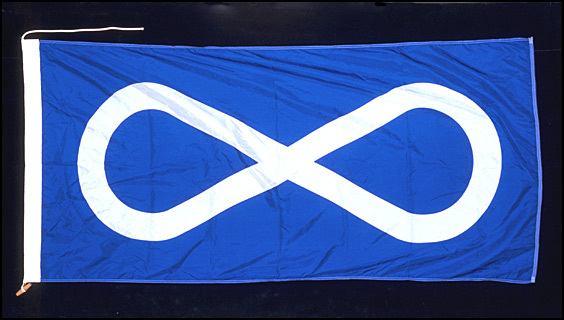 An infinity symbol representing the future of the Metis people. It was changed to red for the hunt. Built as a reliable means of transportation over rough ground and known for the high squeal of it’s wheels. It was an all wood construction. Trains would go out on the buffalo hunts to carry back hundreds of pounds of buffalo meat. Worn over the left shoulder by women and around the waist (usually to hold a capote closed) by men. The capote commonly made from a HBC blanket. 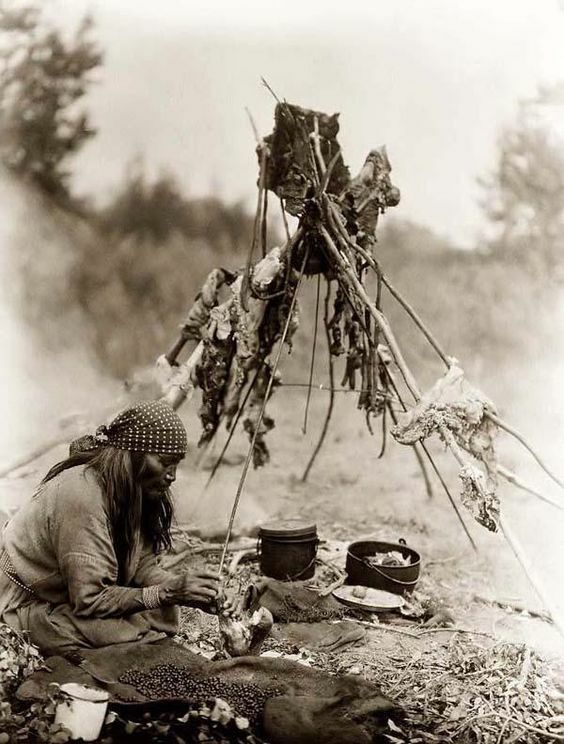 Dried buffalo meat mixed with berries which was a survival food for the native people, passed to the Metis who gained a livelihood from it. It became their main commerce for canoes travelling between forts. Later, the Selkirk settlers would also rely on it to survive. After the buffalo hunt, the women did all the work, skinning, tanning and curing meat. Here is a sample of the music and dance of the Metis people from a town close to where my mother grew up Dauphin, Manitoba, Four Nations Square Dancers. I suppose there are many reasons one would pursue their ancestors down the path and into the past, there to be confronted by errors in judgement, locked and half-open doors and at times utter incredulity. In the space of the last 24 hours, I have been confronted by the wildest errors both in documents and online. It makes one want to laugh and cry at the same time. This is not to say I am an expert by any means but seriously? Apparently, Jean’s father was born after him. Two names have ridiculous variations. Angelique Pambrum, Josephte Dit Doney and apparently he married another man, Amable! Shall I go on? Shame on Ancestry for letting this happen. Get as close to the actual docs as you can. In this case I am looking at Sprague and Frye’s The Genealogy of the First Metis Nation 2012. Jean and his wife Angleique Pangman were both born in 1800. Now these people are are citing Sprague and Frye. Here we have Jean born in 1839 instead of 1829 as in the book (Table 1) to Marie Ann Goneville instead of Janeville. Who’s going to call up Sprague and Frye? Last night as I was nearing the point of exhaustion, I decided to search the Daigneault family for records. I hit a few censuses. Census takers are the bane of a genealogist’s existence. I submitted 3 corrections to ancestry. One of the transcribers unbelievably put the husband of the next family down as the spouse of the head of the family before. The other did not even absorb the initials on the census and put a boy down as a sister. The S was for “son”. That being said some of the censuses are almost illegible. Interestingly, I did not find that at all in Ireland and England. The point is that some of us have to do the work because our ancestors didn’t. Most of my Metis relatives could not even read or write, never mind whether their scrip got ripped off or not. There is ample warning from professional genealogists to check and cite the source of your records correctly. Therefore, I try to find my own records as much as possible rather than using someone else’s tree for the same family. It is rather frustrating when you find that they are for the main part accurate but I still feel better about at least checking things. You run into problems most times because of naming patterns. The son being named after the father for instance. That can also be a help because names tend to run in families. There is also a problem created by indexed records which may contain errors through transcription and the interpretation of at times illegible handwriting. Like most people with the Beauchamp name in Quebec, I knew the pioneers in the family were Pierre, Jacques and Jean. Comparing trees, I saw that I had the wrong line going fairly far back. At that point I had to start checking and double checking to see how many people had the same line going. That would be the line connecting to Damase my great-grandfather. So I would use them as a framework and check each person as I went. Then I hit the Joseph’s in the family. Not fun. There is the name they were called and the name they were baptized with. I was thrilled to see a whole family of voyageurs. I had found records of two brothers I know are in my family, Jacques and Pierre Beauchamp who were voyageurs. Many men had to supplement their income by transporting goods and furs along the rivers of New France. They were two generations back and one of them was called Damase. There are, of course, many resources for Quebec genealogy which you can find at Cyndi’s list. Ancestry is so good at joining things up for you, the index and the original. That is a help because if you are able to actually read the original you will get extra information. So, by looking at the orginal baptismal records, I found out that the two Joseph’s were called by their second names of Theophile and Isaac . Then I started cross-checking with the records at PRDH from the University of Montreal. That is a paying site as well but with a little information you can save some money by looking for the union or family of two known ancestors. They have been kind enough to list the couple with their parents, date and place of marriage along with their children’s information. That costs 17¢ (providing you know who you are looking for). Pretty cool! Then you can go from there.There is also a tree at Nos Origines, another site that is fairly well done. So you can see I am right in the middle of it now. What fuels me? The history of the place and times my ancestors lived in and knowing I am part of that. And the memory of my grandparents. If you are Canadian, you may have grown up with a subliminal awareness of the differences between us and our American neighbors. You would be hard-pressed to find it described more eloquently than in the writings of Francis Parkman. Parkman was the son of a wealthy Boston family who attended Harvard. He spent time living with the Sioux in 1846 where he saw the effects of disease and alcoholism. He also suffered from ill health and lived through the Civil War. His descriptions of native people and pioneering French are a bit jarring though he does make feeble attempt to counter that along the way. To some degree it was like reading a western novel. All his books are wonderfully descriptive especially of the forest environment which was his passion. He is able to distill down a description of the differences between the French and English colonies. Yesterday, I listened to a podcast at Maple Stars and Stripes who was hosting Anne Mordell of The French Genealogy Blog. She pointed out that there has been so much research done on the original families of Quebec that it may possible that you will find all you need about your family without going over to France, though I would never let that little thing get in the way! They mainly covered the archives of France and how to approach them, most of the information which is contained in her book, French Genealogy from Afar. The host, Sandra Goodwin, has a very American attitude though I believe her mother is French Canadian. Very forthright. I found the contrast between the two women’s personalities quite archetypal. Anne had mentioned how to approach the mayoral office of the small French communities by being prepared before you go and perhaps presenting them with a small presentation on your family. I thought I was going to hear a “what!” there for a moment. That being said I cannot help but siding with the Americans on one thing, if I am giving you my money YOU are the one who needs to be considerate of my wishes, barring rudeness of course. But we Canadians are known for our politeness anyway. It does make sense to be prepared otherwise you would be wasting your own money. My experience with genealogy is that it is still to some degree filled with that old moray of “my Dad’s better than your Dad”. I have been to so many meetings where the people, especially the older generation won’t even talk to you. I find the Americans to be much more open and willing than anywhere else. That being said, Anne does have clinics on her website for your “brick walls” and said that if she gets enough of them she will return for a podcast. Which got me to thinking of the numerous brick walls I have. The French one being whether the family were indeed Protestant, which is hard to tell in Canada because you had to be Catholic to get into Montreal and there were workers hired who were Protestant. Most of the skilled tradesmen were Huguenot in France. I thought I would just do another search for the last of the Beauchamp line, one Marc Beauchamp. Nothing on ancestry, nothing on Family Search. But after playing around with names I came upon a page that might have made the connection between the two names Deschamps and Beauchamp which seem to confusingly be passed back and forth the further back we go. This time it was a baptismal registration in Sedan, Ardennes, containing the names of Libauchamp and Deschamps. As below. Fairly far back as records show and another indication of Protestantism in that family. This below is a Protestant registration of Lea Deschamps daughter of Francois. Again, showing that name as Protestant. So the question really is, did the Beauchamp family use St. Marguerite church in La Rochelle in place of their own church as was commonly done at the time? Time will tell. In the meantime, I am simply enthralled with the story of my ancestors. I can’t believe that they were present during much of what I am writing about. You get a sense of how bad it can be when people want to emigrate to a country where they are roasted on spits by the natives! Oh no, Canada was not the benign land it is today. So, why would I write about the Cardinal anyway? For one, he helped to found Montreal through the Compagnie des Cents Associes and supported Samuel de Champlain in establishing colonies there. Further to that, there are many indications that the family Beauchamp were caught up in the Seige of La Rochelle, as below. Once again, we note that the brothers, Pierre, Jacques and Jean’s maternal grandparents were married at the Great Temple of La Rochelle. It is unlikely that Catholics would marry into Protestant families. Next, the boys father, Michel, was gardener at the New Town (on the original record as Villeneuve. After the seige, the Protestants were given land for a new church by the King outside La Rochelle. Would a Catholic work there? After the siege it is unlikely. In 1630, after the Huguenot temple is demolished, the grandparents Jean and Louise disappear from the records, they are listed as burials at sea or in unknown graves. The name of Jean Beauchamp is registered with the National Huguenot Society as a Huguenot ancestor, so we know that the surname Beauchamp was associated with the dissenters. This is a record from Emigration Rochelais en Nouvelle France. We see the name Deschamps used by the older ancestors which is switched out to Beauchamp by Michel. So, his parents die rather mysteriously and he changes his name. There is a record of Jean Deschamps as sitting on the Council of La Rochelle under Jean Guiton the mayor of the city during the Seige. This is from the book by A.M.Paul Marchegay ” Le Seige de La Rochelle”. The previous records state that Jean died in Nantueil so how he got onto the list of unknown burials one can only imagine. The facts remain to be seen, but we can be certain that whatever their religion, the family would indeed have suffered by being at La Rochelle during the seige. However, since Jacques and Marie Beauchamp arrived here as recruits of Jeanne Mance, we will assume they were Catholic by 1659 the year of their arrival at Montreal on the Saint Andre. As you know I am an avid history reader and have just finished Cardinal de Richelieu by Eleanor C. Price. At the same time I have been following the new series “Musketeers”. Of course, everyone knows that the series is a rather creative look at the lives of the Musketeers, Louis XIII and of course Richelieu, played brilliantly by Peter Capaldi. It is swashbuckling fun. By coincidence, I hit a small section at the end of the book where Ms. Price talks about Richelieu on his death bed. ” Louis XIII, himself too ill and depressed to enjoy his hunting as usual, was pestered by Chavigny and de Noyers with messages from the Eminentissime, insisting on the disgrace of four of his best-liked officers- among whom was M. de Troisville, or Treville, the famous captain of musketeers-whose only crime was that they had formerly been friends of Cinq-Mars, and that Richelieu feared their hatred and their influence. The King resisted long, but at last, by sheer angry obstinacy, the Cardinal gained his point, and the four gentlemen were dismissed from the Court, though not from the army; the King showing “great displeasure, even to shedding of tears”. Richelieu was anxious to finish off what ever business he had before his death and was at this point demented with pain. Louis himself was ill. At one point, Louis was brought in his bed to Richelieu to discuss the Spanish treaty and the fate of Cinq Mars, a former favorite of the King turned traitor. 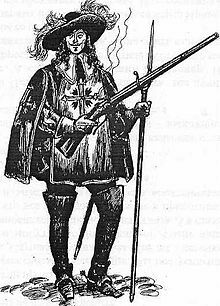 A “mousquetaire” of course, was a soldier armed with a musket, in this case, part of the king’s body guards. I am sure there are much better references for the life of a musketeer and their relationship with the King than Dumas’s novel. It is rather sad to think that all the next generation may know is what they see on TV. My take? Truth is more often stranger than fiction ( and a lot more exciting)! © 2019 Yolanda Presant. All Rights Reserved.